It's timew to start planning for an exciting "Movie Night" under the stars. 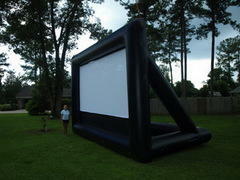 FreshAirParty.com has just the package you need to invite friends and family for and outdoor movie night with our inflatable movie screen rentals. We'll bring everything you'll need and you just provide the DVD's. Browse the selections below and click on the image or "More Info" link for additional information and to make a reservation.